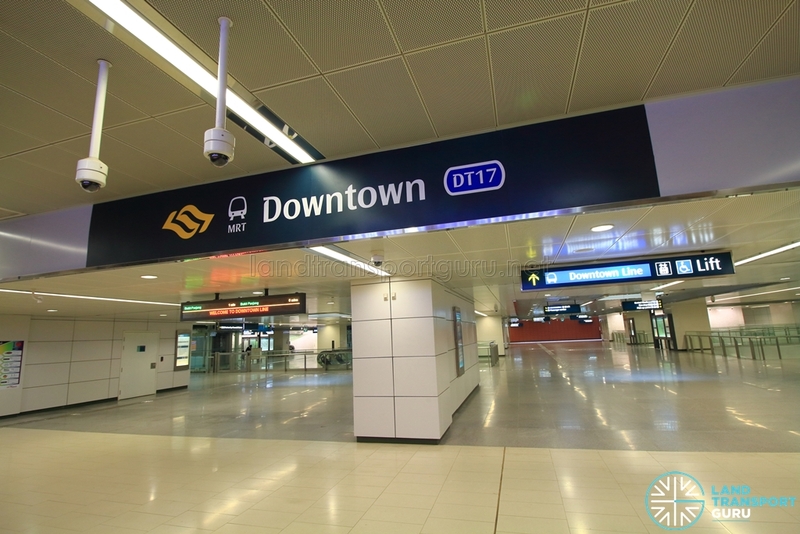 Downtown MRT Station (DT17) is an underground station along the Downtown Line (DTL) Stage 1, located in the Downtown Core (Central subzone). It is built underneath Central Boulevard, near Marina View and Straits View. Located in the vicinity of high-rise office buildings and residential apartments, Downtown station serves the the new and developing Downtown commercial district, as well as the Marina Reservoir area. 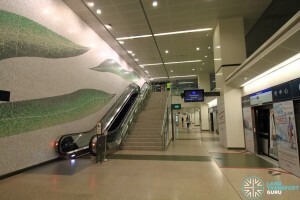 It also serves the subterranean Marina Bay Link Mall (Exit B), which extends further via an underground pedestrian mall network and eventually connects to NS26 EW14 Raffles Place station. 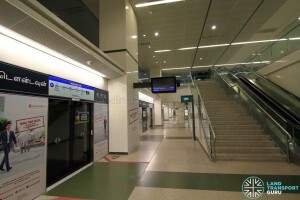 Downtown MRT station has two platforms in a side platform arrangement, similar to Telok Ayer and Chinatown stations further down the line, with both platforms utilized for trains travelling in either direction. Full-height Platform screen doors isolate the air-conditioned station from the tunnel environment, enhancing commuter safety and station comfort. A set of escalators, stairs and lifts connect to the concourse above. The concourse is built as a large enclosed space with the tracks in the middle and the platforms on both sides. above the platforms and tracks, giving the platform a tall ceiling and a greater perception of spaciousness. It features faregates for automatic fare collection and provides access between paid and unpaid areas of the station, with at least one bidirectional wide-swinging gate for the benefit of passengers-in-wheelchairs and those carrying bulky items or travelling with prams. The station houses a small number of retail outlets, while the adjacent Marina Bay Link Mall contains many more retail outlets. 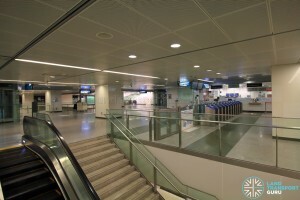 Public toilets are available at Concourse level, near Exit F, as well as located within Marina Bay Link Mall. The artwork draws inspiration from the biological structure of bamboo leaves. Looking through the microscope, the dense cell networks of leaves are a conceptual metaphor for the intricate networks of businesses around the station. The blending hues of green illustrate the vibrancy of the area above. Encountered up close, the mosaic resembles the microscopic view of the biological structure of the bamboo leaves while revealing blades of leaves directing commuter flows when viewed from afar. Downtown MRT station has a three exits leading to street level (A, C and E), with only Exits C and E offering barrier-free accessibility for disabled access. A further three underground exits (B, D and F) extend from the concourse level to adjacent developments. Downtown station connects to two bus stops in the vicinity. There are two official bus stop linked to Downtown station. Taxi stands and pick-up/drop-off points directly connected to the station are unavailable. The nearby Marina Bay Financial Centre (Both towers 1 and 2) have taxi stands and pick-up/drop-off points which are located a short walk away from this station. In addition, passengers can board regular bus services at bus stops officially linked to Downtown station for free rides. As a station serving the Downtown Core and surrounded by dense mixed-use developments, Downtown station encounters moderate to heavy demand levels during the peak hours as office workers commute to and from work and home. 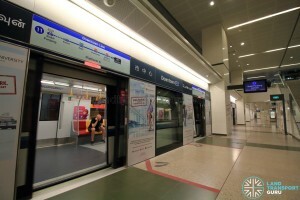 For off-peak hours and weekends, commuters continue to use the station to get to Marina Bay Link Mall and the Marina Reservoir. 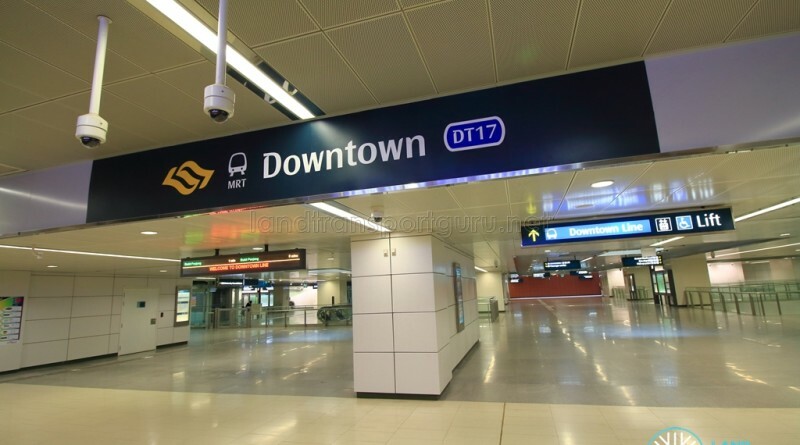 Downtown Line Stage 1 (DTL1) Contract 907 for the construction and completion of the Downtown Station and tunnels was awarded to Japanese company Taisei Corporation for approximately S$230.3 million in Jan 2008. The working name for Downtown station was Landmark Station. The rapidly expanding Downtown Core area will be home to many high-rise mixed-use developments in the future and Downtown station will facilitate movement of people in and out of the area. 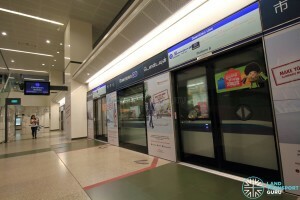 The underground pedestrian mall network will be expanded to new developments currently under construction (as of April 2016), such as the Marina One development and Shenton Way MRT station along the Thomson-East Coast Line by 2021.